Building an escape room, launching a DPO for direct reader investment, and renting a room on Airbnb: all ways newspapers are thinking outside the box to diversify their revenue stream. These ideas all provide valuable insights into how newspapers must start thinking about their reader revenue strategies, including the need for membership programs, asking readers to support journalism financially, and expanding the definition of ‘local’. The Telegraph Herald in Iowa found inspiration for its revenue diversification strategy in an unlikely source: building maintenance manager Dan Bellows. 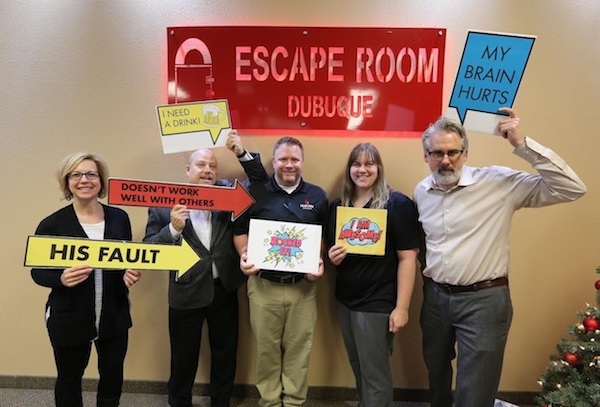 He believed that the newspaper should open an escape room, offering players a series of challenges and puzzles they must solve in order to get out of the locked room. After pitching his idea to CEO Tom Woodward, they put together a team to create the escape room; first developing a business plan through market research and then working to secure a location and retrofitting it for the puzzles and challenges. More than 3,000 people visited in the first three months and the project became profitable after six months. The escape room worked so well in this community particularly because it addressed a gap: a lack of activities for young people. This is something the team at The Telegraph Herald knew was a problem for their community because they had built a strong relationship with their readers. Earlier this year publisher Rollie Atkinson introduced a direct public offering (DPO) to readers of Sonoma West’s four Californian newspapers. By introducing the direct public offering, Sonoma West was able to sell stock without an investment bank, a more intimate version of an initial public offering. The four newspapers have a combined paid circulation of 9,900, and the goal of the DPO is to raise $400,000 by March 2019. Since launching in March of this year, they have raised more than $100,000. New investors are found through daily conversations around town as well as at house parties that allow Mr. Atkinson to make his pitch over cocktails with local residents. Sonoma West’s DPO was inspired by Berkeleyside, an independent news website that had just closed their DPO in which they raised more than 1 million dollars. So far Sonoma West’s DPO has succeeded by highlighting to readers the financial realities of running a newspaper in today’s world. For some of the investors, they feel that by helping to save their local paper, they are helping to protect local democracy as well. For 139 years The Ferndale Enterprise has served the population of Ferndale, California (population 1,372), and for the past few years it has also served visitors from around the world. That’s because in 2015 publisher Caroline Titus put the building that houses the newspaper on Airbnb, offering visitors the chance to stay in a room in the historic Victorian home. Guests even get their names printed under the masthead of the weekly, which comes out on Thursdays. The $175 a night rental offers Caroline Titus and her husband Scott the chance to welcome new visitors to town while supporting their journalism. What’s great about this idea is that it allows the newspaper to serve more than just local readers – now the very definition of local has changed to include outsiders who are just passing through town. While not all newspapers can benefit from putting their beautiful Victorian offices on Airbnb, all newspapers can broaden their definition of local, and the community that they serve. In this digital age, local is more than just the geographical bounds publishers commonly define as their coverage area. A local audience often includes people who no longer live in the area, but have a meaningful connection to it. Publishers can expand their audience and develop different acquisition and subscriber strategies for non-local readers, helping to diversify revenue streams as they move beyond the advertising-only model.